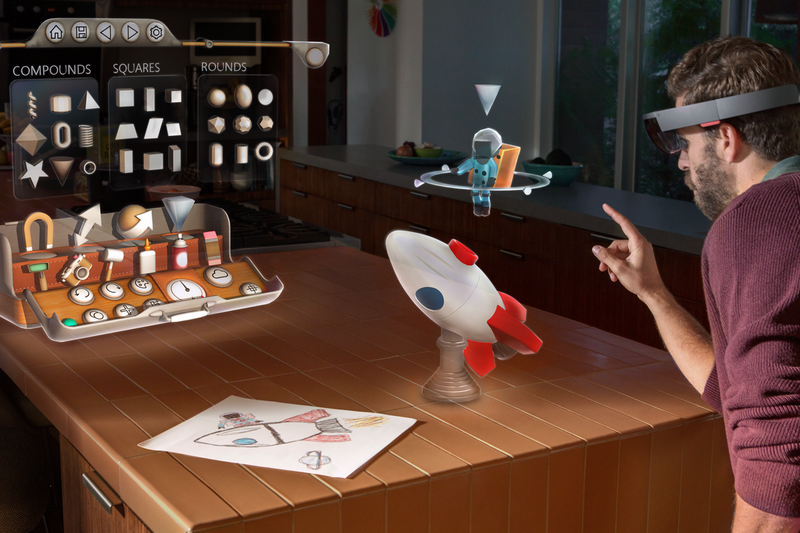 Millions of people have seen Microsoft’s astonishing HoloLens videos. Far fewer have seen the limited, but still impressive, reality. And that’s something Microsoft wants to change. Starting today, the company’s New York flagship store will play host to what it’s calling the HoloLens Experience Showcase, a semi-permanent setup where developers can try a handful of mixed reality toys and tools. It’s a stopgap between traveling demo shows and the development kits that Microsoft will begin selling early next year — and one more step toward turning HoloLens into a viable computing platform. 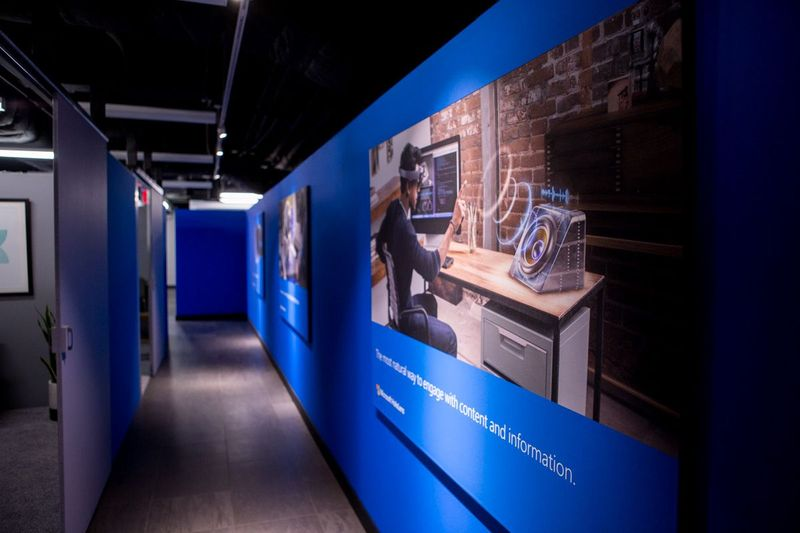 When I visited the showcase earlier this week, Microsoft had set up what looked like a large trade show booth in a quiet upper floor of its recently opened Fifth Avenue store. The whole experience is presented like a tour: after a short introductory speech in a conference room, visitors are shuttled between three rooms, each with a unique demo. The weirdest moment is HoloLens' customary interpupillary distance (IPD) measuring ritual, where you're given a card with a number to present at every station. 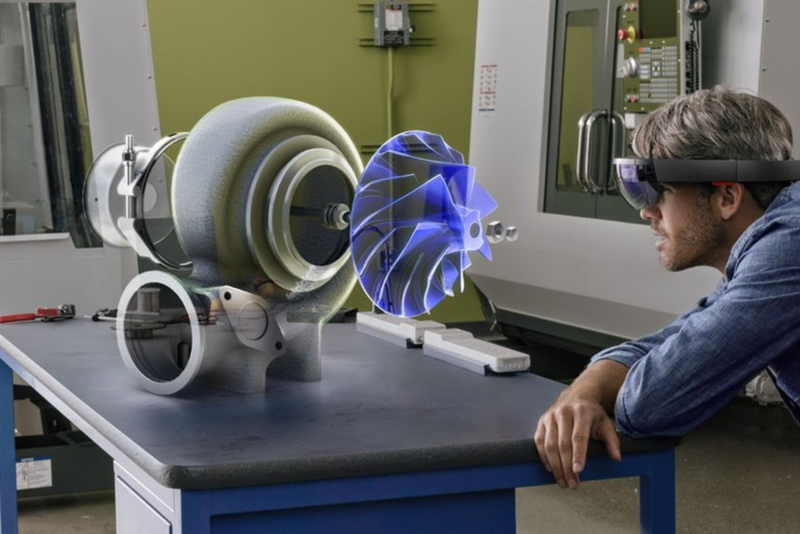 There's nothing mystical about IPD — especially not to anyone who's worn glasses — but especially after a detailed instruction video for putting on the headset, it drives home the idea that HoloLens is a precision tool. Microsoft has been letting internal developers show off little HoloLens experiments lately, but two of the three showcase demos have been in its lineup for months. The slate is carefully tuned to show off a range of capabilities, while apparently avoiding anything branded; you won't find Trimble's architecture modeling software or the NASA Mars visualizer, although Microsoft says the roster could change over time. HoloStudio is Microsoft's holographic version of MS Paint, using a combination of "air taps" and voice commands to move and recolor objects in a scene. Project X-Ray is both a fast-paced, controller-based game and an example of HoloLens' room scanning options — in this case, you're shooting at alien robots crawling out of your walls. The third, previously unseen project is more difficult to pin down. It's something that Microsoft calls "holographic storytelling," a creation tool somewhere between 3D animation software and Microsoft PowerPoint. The demo I saw was firmly on the PowerPoint side. A voice guided me through tweaking a presentation about a new luxury watch, moving labels and gauging viewers' interest in different sections by tracking their gaze (assuming, of course, that they're also wearing HoloLens). Unfortunately, while the showcase can certainly expose more people to the system, it doesn't seem designed at giving anyone a deeper look. There's no time to explore more than the most basic elements of each app, which means that it's hard to tell how useful something like HoloStudio really is — it's supposed to have all the options of a desktop paint app, but I've tried it twice and still never gotten further than rotating fish and spray-painting an X-wing fighter. This makes sense, insofar as Microsoft is demonstrating specific concepts, not promoting its own work. But it's still disappointing, because the biggest benefit for me was getting some small sense of familiarity with the device. It took maybe a dozen tries to put the headset on in a way that let me see clearly, but being able to do it made HoloLens feel a little more like a computer I could imagine using. A computer is exactly how Microsoft wants us to think of this, and the team seems at least a little irked whenever someone compares its $3,000 development kit to the $350 Oculus Rift DK2. So it's also a shame that we haven't seen one of Microsoft's big selling points: universal apps. The experience of using them will probably be less flashy than the current showcase demos, because intuitively, any universal app would just be a flat image projected into the air instead of onto a monitor. Microsoft has indicated that they'll probably work with a Bluetooth keyboard and mouse, which is a lot more prosaic than the Minority Report-esque air tap system. But prosaic experiences are the ones that will turn HoloLens from an accessory to a fully usable computer substitute. The more pressing question is how long this showcase will be necessary. Ideally, development kits will be widely available enough next year that would-be HoloLens developers can either buy or borrow one and experiment on their own time. But we only know that the first wave of them (which, again, cost a hefty $3,000 apiece) will be shipping in the first quarter of 2016. Microsoft tells us that it expects the showcase to be around for at least a couple of months. As for everyone who's excited for HoloLens, but not a developer? We're still in the dark.